Ten-year-old Mary has always wanted to win a Nobel Prize. She loves running her own science experiments at home. But how can she become a real scientist and win the greatest prize of all?One day Mary stumbles on a secret meeting of Nobel Prize winners. Swearing her to secrecy, Dr... read full description below. Ten-year-old Mary has always wanted to win a Nobel Prize. She loves running her own science experiments at home. But how can she become a real scientist and win the greatest prize of all?One day Mary stumbles on a secret meeting of Nobel Prize winners. Swearing her to secrecy, Dr Barry Marshall agrees to be her guide as she travels around the world and through time to learn the secrets behind some of the most fascinating and important scientific discoveries. 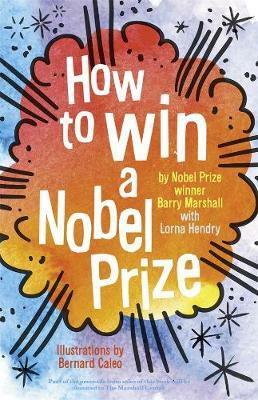 They talk space and time with Albert Einstein, radiation with Marie Curie, DNA with Crick, Watson and Wilkins - and much more.How to Win a Nobel Prize is a funny, fascinating adventure story for ages 9 to 12, and includes experiments that young scientists can do themselves at school or at home. Barry Marshall won the 2005 Nobel Prize for Medicine, with Robin Warren, for discovering that stomach ulcers can be caused by bacteria and can be treated with antibiotics. He experimented on himself to prove their theory. Lorna Hendry is a writer, editor, graphic designer and teacher but, long before all of that, she studied science at university. She loves the challenge of making science fun and easy to understand. Lorna has written books on a range of topics, from endangered animals to genetics. She has never won a Nobel Prize. Bernard Caleo discovered the Tintin series of comic books at his local library when he was five, and this shaped his entire life. These days he draws pictures, writes words, and makes comic books.